In part one of this series, we discussed the fundamentals of facility measurement and the impact building column types and spacing can have. The most common issue people have with layout tends to be building columns, but working with obstructions is a close second. Let’s break down the common obstructions that can throw off your measurements. When you are placing items in a layout, visualize a three dimensional box placed over the item. As seen above, you could have a group of shelves in the middle of the layout. Your imaginary box around those shelves should be measured for its width, length and height so you can understand exactly where it goes and the space it consumes. 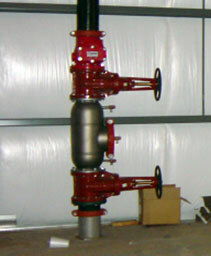 The same method works for machinery, panels, duct work and other items. 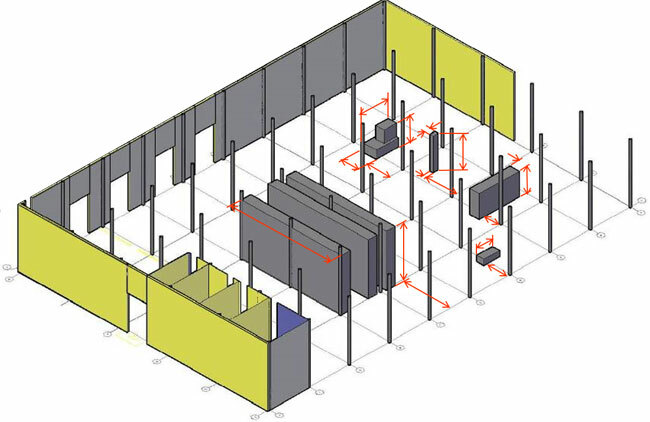 Most manufacturing and warehousing facilities will not be perfectly square boxes, even though they are designed to maximize the cube as best they can. They have electrical panels, guardrails, offices, mezzanines, plumbing, door tracks and lots more. These obstructions can all be accounted for in a good design phase, but they have to be defined with accurate dimensions. Every facility has doors, walls and openings that must be accounted for as you move forward. Sometimes these are cubed out and easy to deal with, but not always. In the first post in this series, we discussed base line dimensioning. The ideal way to place doors, windows or wall openings is to mark them along your established base line. When you do this, also note any column locations. 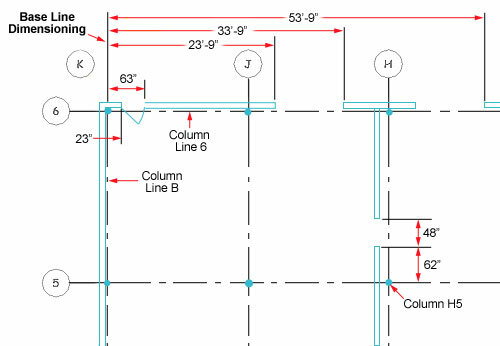 In this case, the door at the top left of the drawing above is located at column K6, and is 63″ along column line 6, while opening 23″ along column line K.
The wall opening on the right is located along column line H, at Column H5. It occupies 48″ along column line H. This makes it easier to discuss these obstructions and understand their impact on facility layout. These principles should also work for obstructions such as staircases and build-outs. 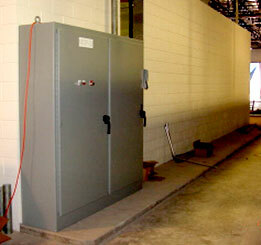 Any industrial facilities have electrical and controls panels in their warehouse space. These items are typically mounted on a wall, but not in every case. Understanding their location and dimensions can help create a more accurate and realistic layout that can help avoid mistakes. Ideally, if you have existing facility drawings in AutoCad or other drafting programs, it’s best to add these items to your drawings. To correctly measure these, note their locations using the baseline measurement method and align with column locations. Clearly label each item, then list the length, depth and height of each obstruction. The physical location of the obstruction should be noted on column lines/baseline dimension, along with the measurements of the obstruction. Outline these obstructions as shown below. As always, a photo of the item is always helpful. When measuring a facility for mezzanine, rack or other vertical equipment, it’s important to note the clear ceiling height. That’s defined as the space between the floor and the lowest hanging ceiling obstruction. 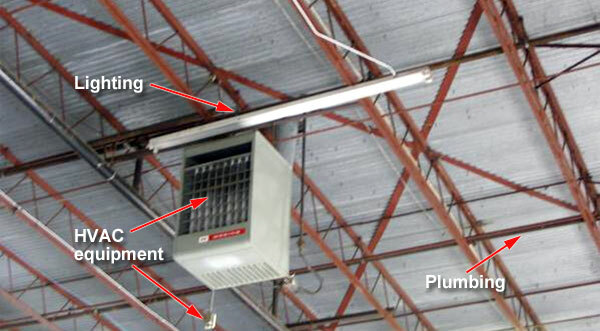 That obstruction can be a ceiling support, a light fixture, pipes, HVAC equipment or anything else that’s attached to the ceiling and drops into the “storage cube”. Aside from the full space, you’ll need to leave clearance beneath that obstruction. For instance, a pallet rack with a 36″ tall load would require you to subtract 36″ from the lowest hanging obstruction, plus room to place and pick pallets (48″ at least). A mezzanine would usually require seven or eight feet, beneath the lowest obstruction, and could require more space depending on the mezzanine load and application. Static equipment such as existing or planned racks, shelving, work areas, cabinets or lockers. In-plant offices and other structures. Mezzanines offer some special circumstances. Measure the width, length and height. Make sure to account for access points such as stairs, vertical lifts and incline or spiral conveyors that help create extra obstacles. Personnel paths. These don’t actually occupy physical space, but you have to leave room for them. If the walkway has handrails, include those in your calculations. Pipes, HVAC tubes and duct work. Overhead door tracks and operating space. 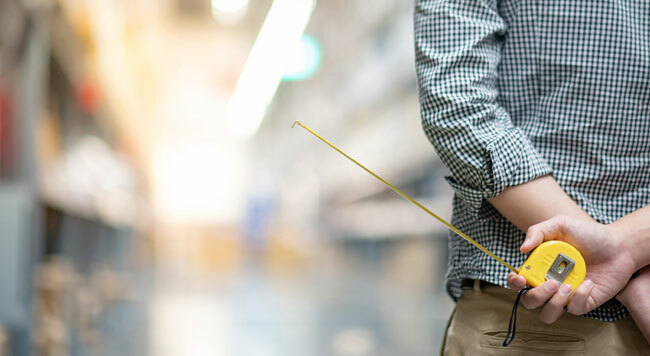 Our sales and layout teams are experts at measuring facilities to get it right the first time, and are always willing to assist our clients, but when you have to take a measurement yourself, we hope these guides are helpful. If you have questions, contact us today! 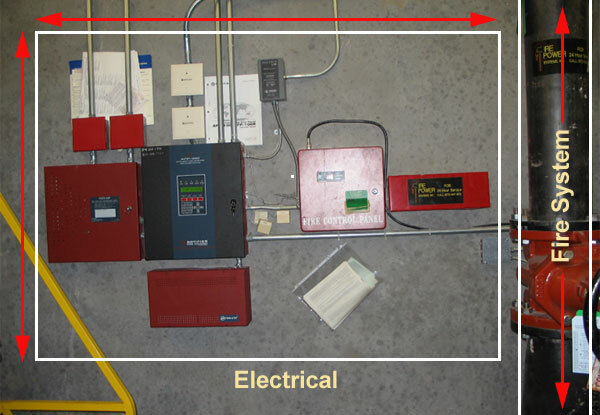 This article is part of a series of articles on Facility Measurement. Click on a link below to view one of the other articles.